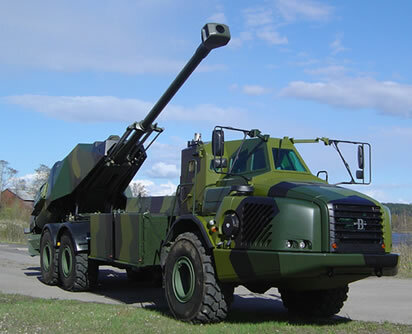 The Swedish ARCHER Artillery System concept is the further development of the Bofors manufactured artillery gun 155 mm howitzer 77B, in which the gun’s gun carriage is mounted on an articulated hauler (dumper) from Volvo. The gun has been upgraded for better fire power and compatibility with international ammunition and has been equipped with the necessary equipment to facilitate remote operation via the gun’s computer. This means the crew does not need to leave the cab for normal gun operation. The cab provides the crew with a protected work environment ensuring extreme endurance during severe circumstances. The protection includes ballistic protection, mine protection, NBC protection, fire protection and noise protection. The workplaces in the cab give the operators total control over the system. Among other features the gun computer can handle ballistic computations, firing, VO measurements, security checks, ammunition handling, communication, command and fire control, navigation, operational follow-up, surveillance/observation close-in protection and fire control. To facilitate close-in protection, an external remote-controlled sensor and weapon platform, PROTECTOR from Kongsberg Defenc & Aerospace AS, has been mounted that serves as secondary armament. There are several storage boxes in the rear chassis for storing radio and computer equipment, gun accessories, extra ammunition, the crew’s heavy baggage, and more. 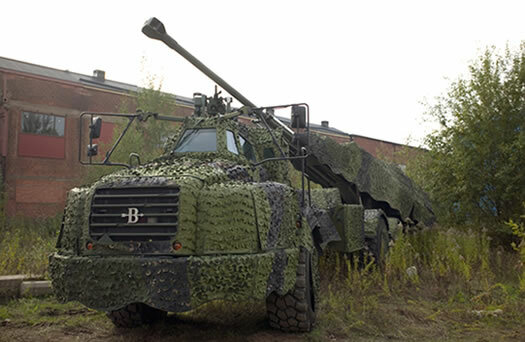 The truck as a whole has been equipped with weight-optimised ballistic protection and mobile camouflage system (MCS). The gun system’s excellent fire power and brief redeployment times allow a combat technique that considerably improves survival for the gun system while simultaneously ensuring high momentary effect in target shortly after the order to fire is received. With modern ammunition, the system can engage with armoured targets and precision fire from long distances. The ARCHER system is interoperable, adapted for international environments and can operate in different climate conditions. The system will use the NATO method for ballistic computations and is customised for NATO’s map reference system and NATO ammunition. Shell loading: Ammunition loading is executed from a Ammunition re-supply vehicle (ARV). The Artillery system 08 includes one ARV per gun. Time for loading shells: maximum 8 minutes. Shells are loaded by gun and ARV personnel in defence position. If the situation requires, the gun can be loaded with shells by ARV personnel alone. Maximum range of fire: 30-50 km. The range is related to ammunition type. For standard shells, approximately 30 km. For base bleed shells, approximately 40 km. For precision-guided shells (XM982 EXCALIBUR), approximately 50 km. Fire endurance: 72 rounds/35 minutes. This rate ought to be repeated six times/day, which means the system can fire a minimum of 432 rounds/day. The number of instantaneous rounds in target is extremely dependent on the firing distance and several other parameters. No exact figure can therefore be provided, only ballistic computations conducted on the individual firing instance. Methods for MRSI firing are being developed and will be included in ARCHER. Ballistic computation function for firing on moving targets, on land and at sea, are being developed and will be included in ARCHER. Direct firing is possible with the gun barrel aimed sideways in any direction. Straight ahead, the cab serves as a mask in low elevations. The sensors in the secondary armament are used for direct aiming. Gun barrel length: L52 (8.06 m) which compared with the 155 mm howitzer 77B, this gun barrel is about 2 metres longer which improves the range of fire. Chamber volume: 25 litre. The choice of chamber volume is a deviation from JBMoU which has a 23-litre chamber volume. The reason for this is to facilitate firing heavier grenades with the highest charge without exceeding the gun barrel’s maximum pressure level. Shell magazine, capacity: 21 projectiles. The magazine handles all 155 mm projectiles with a length of maximum 1000 mm and a weight of maximum 50 kg. The grenades are arranged in ready-use rounds in numbered bowls. Manually settable fuses are set in advance while inductive settable fuses are automatically set in the ram phase, immediately prior to firing. The gun computer monitors all ammunition data and when firing is ordered, the desired bowl is commanded to the feed position automatically. Charge magazine, capacity: 18 rounds. The magazine handles both bag charges and modular charges. The ready-use rounds arranged in numbered bowls. The gun computer monitors all ammunition data and when firing is ordered, the desired charge bowl is commanded to the feed position automatically. At present, the size of the charge for each respective charge bowl is determined when filling the magazine. One potential area for development is a different type of charge bowl that only handles modular charges but with the advantage that the charge size is not predetermined but can be adjusted to the combat circumstances. Primer cartridge magazine, capacity: 40 primer cartridges. New primer cartridge magazine with higher capacity replaces the old magazine. On “click” a new primer cartridge is fed forward and new discharge released without the crew having to leave the cab. Projectiles, compatibility: Most types of shells/projectiles. Maximum length is 1000 mm and maximum weight 50 kg to facilitate machine loading and firing with the highest charge. This is an improvement on the comparable JBMoU barrel. Modern Swedish ammunition that will be fired in ARCHER includes BONUS and EXCALIBUR. Charges, compatibility: Most bag charges and modular charges as specified in JBMoU. Bag charges and modular charges on the market can be fired with some restrictions. A modular charge of type insensible munitions (IM) will be acquired and evaluated for the test guns. Secondary armament is a remote-controlled sensor and weapon platform (PROTECTOR) mounted on the roof of the cab. The vehicle is a commercial Volvo articulated hauler (dumper) adapted to carry the artillery gun. The basic philosophy is to retain the vehicle’s standard design as much as possible and avoid special solutions. Environmentally certified in line with current and future emission requirements. Emergency driving equipment: All wheels. Emergency driving equipment (Hutchinson AMVFI) makes it possible to drive with all wheels punctured. It also provides greater protection if the vehicle hits a blast-pressure mine. 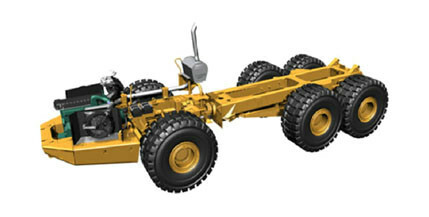 Skid protection: Two axles. Skid protection allows better accessibility in difficult terrain conditions and on winter roads. Storage space: A centre chassis and four side boxes. Equipment stored in the storage spaces includes radio and computer equipment, batteries, gun accessories, extra ammunition and the personnel’s heavy baggage. The side boxes are dimensioned for Euro pallets and are also moveable on the truck’s frame. 4 men consisting of one driver and three operators. The gun system can be manned by 2 men (driver and one operator) if necessary. The cab provides a protected environment and has all the necessary equipment to enable one crew to operate the gun system for minimum 24-hour duration. Communication equipment: SLB, a C2I system for Battalion level, with a software defined radio, TDRS, Tactical Data Radio System. Radio equipment for external communication: Ra 180M, 2 pcs. Communication equipment for internal communication: SRR, Short Range Radio, 4 pcs. Each member of the crew has wireless equipment to allow internal communication. Navigation equipment: Position and azimuth determination equipment (POS), accuracy: 0.5 mils GPS supported. The Swedish Army has ordered 24 ARCHER’s. Some are rumoured to have been delivered. Denmark – The Danish Army was in the process of acquiring 12 to 18 Archer Systems, but due to budget cuts the order has been cancelled. Instead the CAESAR self-propelled howitzer will be purchased. Norway – Had ordered 24 ARCHER’s but cancelled the order in December 2013.